Back in the eighties, John Gage of Sun Microsystems coined the phrase, “The network is the computer.” Today, the services made possible by the Internet and our use of them as individuals and organizations affirm John’s statement perhaps in ways they were not even imaginable three decades ago. Technology trends such as the Cloud, Big Data, the Internet of Things, and others, make the Internet seems less like a data transport mechanism and more like a global computer that drives the world’s economy. In the basic computer architectural model, known as the Von Neumann architecture, an input device is used to enter the data into the computer’s memory. The central processing unit (CPU) process the data following precise instructions (programs) also stored in memory. The processing results are sent to an output device. All these components are connected by a data bus (a set of wires and connectors) that carries the data back and forth between the components. The computer also needs power, cooling, and housing. The Internet allows its users to generate massive amount of data and share it: emails, blogs, social media posts, digital photos, online orders, and many others. Connected machines also generate data: event logs, communications protocols, sensor information, GPS tracking, activity and health monitors … etc. The ability to connect everything that produces data to the network, not only desktops and network devices, gives rise to the concept of Internet of Things (IoT). Extending the Internet’s connectivity beyond the traditional computers to a vast number of other devices is expected to generate even larger amount of data of different formats, using multiple technologies. 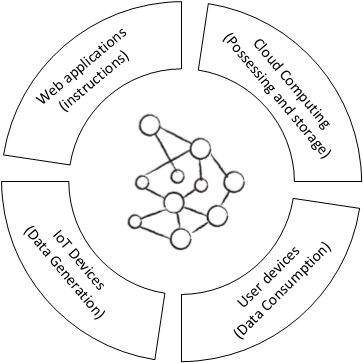 The devices of the IoT are the Input in the computer model. People also consume large amount of information from the Internet: news, music, videos, books, weather forecasts, maps, chat, and social networks notifications. Traditional “stationary” computers have long lost their status as the dominant technology used to access the Internet. Nowadays, laptops, tablets, smart phones, smart watches, entertainment devices (including smart TVs) and game consoles are extensively used at home, at work, and on the road to consume information in various forms from the Internet. People’s attachment to these devices and their need to stay connected anytime and anywhere created a demand for mobile connectivity to the Internet. This assortment of devices and the technologies that support their mobile connectivity are the Output in the global computer model. A software application is a set of instruction that reside on computers and process data to turn it into useful information. Since the dawn of the world-wide-web (WWW) and the browser, applications have shifted from being locally run on a computer to being run somewhere in the Internet. Web applications allow the capture, processing, storage and transmission of all forms of data supplied by the users. The results are then presented to the user within their browser to be downloaded to the local machine or kept stored remotely. Web applications opened the door for businesses, schools, and governments to provide services to the users in a way that had never been possible before. Another significant advantage of web applications is that they function regardless of the type of device the user has. This means the user can run the web applications on virtually any device and anywhere. Organizations that need to run web applications also need to maintain sufficient processing, storage, and environmental resources to handle growing demands for these applications. The challenges of meeting such demands and others, such as security, are difficult to meet for most organizations. The Cloud computing model and virtualization technologies offer ubiquitous processing power and storage components that satisfy organizations need for their applications. The Cloud services move all servers and storage an organization relies on to host its applications and store its data to a third-party organization. The absence of in-premise servers also eliminates the need for support infrastructure such as housing space, power, and air-conditioning. Whether it is within a single building or covering the entire world, the network provides connectivity and enables data transport between independent nodes. The Internet, however, is not just the data transport mechanism between different components, the Internet is what makes all these components possible. Hence, the Internet is the Computer. The Internet may not be an exact Von Nauman machine as it is portrayed here. The individual computer did not disappear either. In fact, all user devices remain fundamentally computers of the same basic architecture. But the need for an individual computing device is diminished tremendously in favour of the mobile, distributed, scalable, (and possibly fractal) computing platform that the Internet represents. Behind the Wall – What is the Internet Anyway? “Do you have a computer tethered by a data cable to the wall?” I responded. This conversation happened just a few years ago, but the technologies that make up the networks have changed so much that I doubt the explanation I gave to my cousin will work at this time where most user devices are mobile. This post will be the first in a series in which I will explain what goes behind the wall from the simple cable to the Internet. I will describe the Internet, what the Cloud means and explain concepts such as Big Data and the Internet of Things. I will not be diving into much technical details but the posts will include some technology jargon and hopefully there will be some useful information for everyone. The Internet is an interconnected mesh of networks operated by private, public, academic, business, and government organizations. The Internet has no single owner nor a single governing body, but it is glued together by some rules that all these organizations have to agree to follow. Among these rules are the so called TCP/IP protocol, the IP addresses, and the structure of the networks. In order for all the machines that are connected to the Internet to talk to each other they have to use the same set of rules, known as communication protocols. The Internet’s main set of protocols are known as TCP/IP suite. The TCP/IP origins date back to the 1972 and its current form splits the communication functions into two: The Internet Protocol (IP) is responsible for giving all machines unique identification, addresses. IP also finds communications paths from one machine to another regardless of how far they are located in the Internet. The Transmission Control Protocol (TCP) is responsible for ensuring that the machines at both ends of the “conversion” talk reliably, regardless of the conditions of the network. For the billions of machines that make up the Internet to be able to find and communicate with each other, they must have a unique address. The widely-used IP version 4 (IPv4) allows more than 4 billion machines to be connected to the Internet. The IPv4 addresses are presented to human users as a sequence of four decimal numbers separated by dots (e.g. 192.168.20.5). Since no human can possibly remember all the IP addresses of all the machines that he/she needs to contact, another system known as Domain Name Servers (DNS) is used to translate IPv4 addresses such as “50.62.218.1” to more human-friendly host names such as “adhocnode.com”. The administration and coordination of Internet related activities, such as the assignment of addresses and domain names to different organizations, fall under various organizations. One of these organizations is the Internet Corporation for Assigned Names and Numbers (ICANN), which coordinates the assignment of IP addresses through five Regional Internet Registries (RIRs). Another well-known organization is The Internet Engineering Task Force (IETF), which is responsible for developing and promoting Internet standards. These organizations consist of individuals from across the Internet’s technical, business, academic, and other non-commercial communities who are interested in the evolution of the Internet. The Internet is often represented in the technical drawings by a cloud symbol to hide the complexities of the networks from the Internet. The “Cloud” has also found it way to the everyday vocabulary after the rise of the social media and online services, such as cloud storage. In my next post I will uncover some of the details hidden in the cloud and describe the structure of the Internet.